There are so many ways to bezel a cabochon! Here is a chain mail one which uses a Half - Persian 3- in 1 weave. The instructor is Yvonne Williams. This tutorial is an excellent one for learning this weave. I particularly like the way she prepares the rings - pairs of open and closed rings. Using two different colors also makes it easier for learners. She is using 16 G 5/16 inch ring sizes for the demo and she recommends you practice with larger rings first. If you prefer a tighter weave, use 16 G 1/4 inch rings. My preference would be 18 G 7/32 inch ring sizes. Still big but not too big. Only when you are accomplished, then by all means try 20 G 5/32 inch rings. You can go smaller but honestly, I think those smaller rings are for masochists! One tip is to use a binder clip to hold the beginning set of rings - when there are 3 silver rings stacked as shown in the tutorial. Starting chain mail is always the trickiest part. Watch carefully how she joins the ends. You definitely need to watch this step a few times. 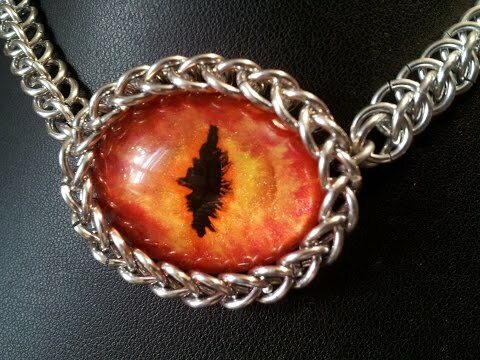 She uses two part epoxy adhesive to make the chain mail stick to the cabochon permanently. The brand she uses goes yellow with age. So an alternative is preferable if the cabochons are clear. This weave can also be turned into a stretch bracelet using rubber rings in the same size as shown with her next tutorial. It is harder to see the weave being demonstrated in the following tutorial because of the black rings. So the first tutorial will also help. I too think she is inspirational and an excellent teacher! I hope to feature more of her outstanding videos!